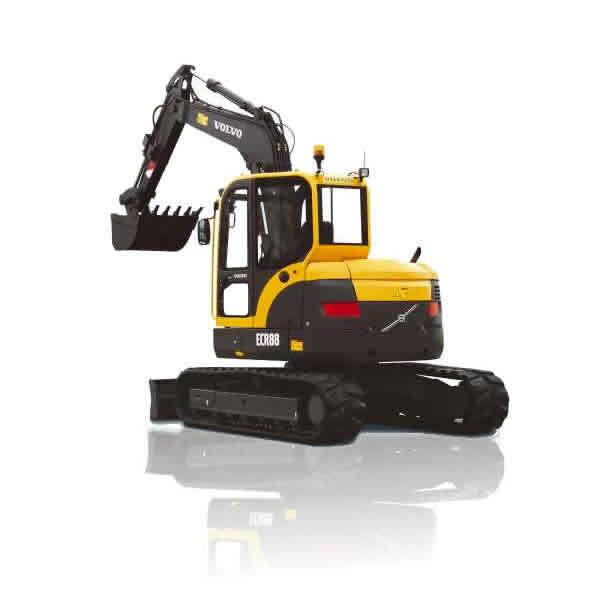 The Volvo ECR88 Excavator has a short swing radius for the ultimate maneuverability. You won’t sacrifice comfort with the wide operator’s area, filled with plenty of features to make even the longest days possible. Very compact machine with the ability to to offset the digging equipment, allowing you to work safely in confined spaces, without hitting the walls, obstacles or other workers. Wide and uncluttered cab with plenty of leg room. A deluxe, adjustable suspension seat with a high back for excellent comfort. The joysticks and ergonomic arm rests are adjustable and mounted into the consoles. Large, flat glazed surface area on all sides, thin cab pillars and wide windscreen increases visibility. Exterior rearview mirrors also increase visibility and safety. Heating and air-conditioning help to increase cab comfort for the operator. The instrument panel is in front of the operator for easy view. Easy-grip, highly responsive control levers. A roller on the right control lever gives the operator the ability to control the accessory circuit with your fingertips rather than the traditional foot pedal. A button on the front of the joystick sends maximum flow to accessories for increased comfort and better productivity. Rubber mounted cab to reduce vibration from the hydraulics and engine. The quiet, new generation engine reduces fatigue and improves safety. Ensure you have the right product for your requirement by speaking to our support team. Can usually be delivered within 24 hours.